The Trade Unionist and Socialist Coalition (TUSC) stood 78 candidates across 24 local authorities in last Thursday's local council elections, as well as candidates for the mayor of Doncaster and the Liverpool City Region Metro-Mayor. Overall the TUSC candidates won a total of 15,407 votes. A report of the campaign, with details of the full results of every TUSC candidate, has been prepared by the TUSC National Election Agent (see the draft report at http://www.tusc.org.uk/txt/400.pdf), and will be discussed at the TUSC national steering committee meeting this week. When Theresa May made her surprise announcement of a general election in the middle of the local election campaign it was obvious that, whatever the TUSC candidates did, this would cut across the council contests. Driving the Tories out on June 8th and the election of a Corbyn-led Labour government would clearly create the best conditions to defend local public services. While the pitch could be made that a TUSC vote in the council polls would be a declaration of support for Jeremy Corbyn's anti-austerity message against the attacks on him by the Tories and the Blairites, there would inevitably be a polarisation on national party lines. And that's what happened. In Doncaster both Labour and the Tories put on ten thousand votes compared to their performance four years ago in 2013. In the Mersey Metro-Mayor contest Labour won comfortably in every one of the six boroughs that constituted the Liverpool City Region but the Tories were second, even in Liverpool itself. The Tory candidate, Tony Caldeira, had stood for mayor of Liverpool twice before, in 2012 and 2016. On both occasions he was outpolled by the TUSC candidate, ex-Labour councillor Tony Mulhearn in 2012 and Roger Bannister last year. On the back of Theresa May's general election move it really was a case of third time lucky for him! But while coming sixth overall it was significant that TUSC was the fourth party in Knowsley, ahead of UKIP and the Greens, and outpolled UKIP in Liverpool itself. This is the third time that TUSC has beaten UKIP in Britain's eighth biggest city, following the Liverpool mayoral elections in 2012 and 2016 - surely now there should be at least one BBC Question Time appearance for TUSC! 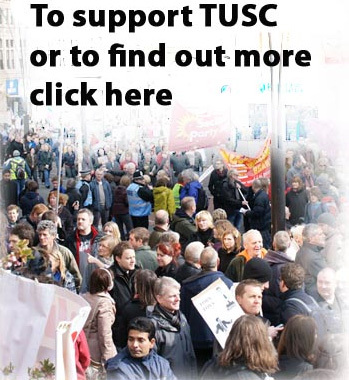 With the announcement of the general election the TUSC national steering committee released a press statement by the national chairperson, Dave Nellist, welcoming the chance that now existed to drive the Tories out of government (see http://www.tusc.org.uk/17358/22-04-2017/tusc-chair-dave-nellist-welcomes-general-election-chance-to-drive-out-the-tories). But this included the recognition that "a general election intervention is different to building a campaign against local Blairite councillors, and in a hastily called snap election especially so". Now the steering committee will have to discuss how best to take forward TUSC's founding aims in a new political situation which will potentially throw all 'established political facts' into question. That obviously includes whether Jeremy Corbyn remains for long as leader of the Labour Party after June 8th - even if Labour has a majority of MPs - and what that would mean for working class political representation. Including this year's elections around 2,400 candidates have appeared on the ballot paper under the TUSC umbrella since our formation in 2010, polling over 360,000 votes. Whatever lies ahead, TUSC, and the model of an inclusive coalition it has provided, will be a player in the events to come.